Mark Tjarks is a professor of English and chair of the Department of English & Applied Linguistics. He teaches scriptwriting, film, and literature. In July 2016 his Family Googling was presented at the Off Broadway venue Theatre at St. Clement and in August 2016 his play Houseless in Paradise, which won a Po’okela Award for Best Overall Play in 2014, was selected as a Festival Best Bet at the New York International Fringe Festival. Ran Xia’s Theatre is Easy review of the Fringe Festival production called Houseless in Paradise “one of the most powerful pieces of documentary theatre I’ve seen.” In September the Tallahatchie River Players performed The Unsalable Thing in New Albany, Mississippi to honor its having won First Place in the William Faulkner Literary Competition Best Play Contest. 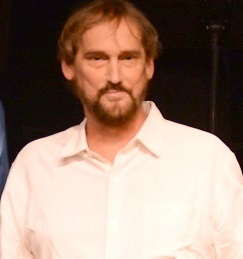 Tjarks is also a recipient of Kumu Kahua Theatre Playwriting Competition’s Resident Award, two Women in Theatre Best Comedy Awards, Aloha Theatre’s Opie for Best Play in its Original Play Festival, and judges’ and audience’s awards for Best Play at PlayBuilders 2015 Festival of New Plays (he is currently PlayBuilders Resident Playwright). His most recent production was a documentary musical based on actual subway musicians entitled Playing for Change, which was presented in September 2017 at the Theater for the New City, in the East Village, New York. He has had 32 productions and staged readings of 15 one act and feature-length plays since 2004.